Happy October! Starting off with a picture of these girls - I think that's mandatory. 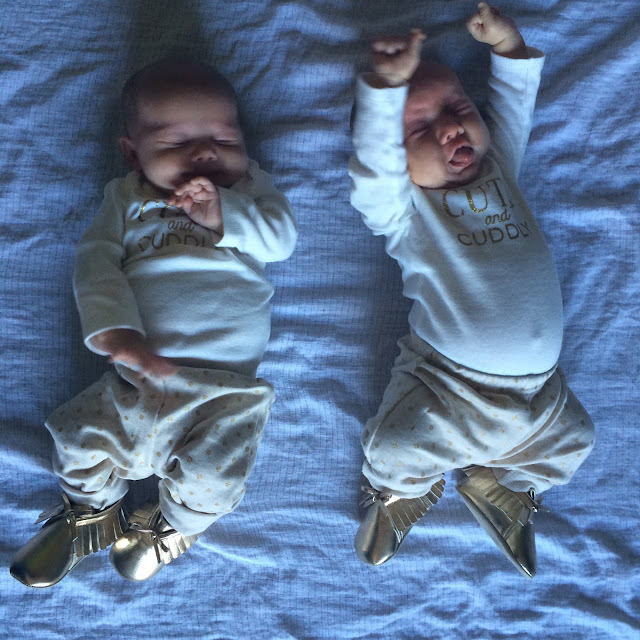 Got these adorable gold moccasins this week - they're clown feet huge right now, but they do keep their socks on. That's my justification for letting them wear them already. I am loving these first crisp days of autumn. And I'm ignoring that winter follows these lovely days. Denial. Biggest news this week: we got an offer on our house!! We countered, they accepted. Now there is just the inspection that'll happen this week. Hoping by next weekend that we'll be able to move completely out of that house and 100% into this one. We are so excited to have our bed and kitchen table. The girls are one month old and sleeping okay at night - I've been getting up twice with them, and that feels like a win at this point. Sometimes it's three times, but that's my fault - I'm often too lazy to wake up the other one and just deal with having to wake up an hour later. Whatever. I'm working on a blog post for their one month - I mean, Wade is - but I want to snap some pictures first, and that just hasn't happened. Finding the time and having no one poopy or covered in spit up is quite the trick. Everyone's been loving the play mat. Typical Jacqueline (the one screaming). 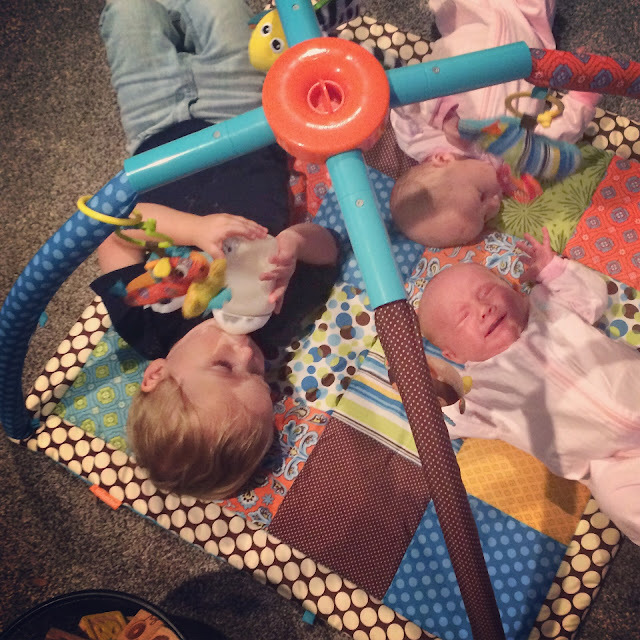 In this middle picture the girls got tummy time while they had to wait a little longer to eat. They fussed and wiggled their way right off the mat. Our ward split - just as we got in! It was pretty emotional for a lot of people. We're planning on having joint ward playgroups so we can stay close to people in the other ward. I don't feel very affected since I spend most of church in the nursing lounge, it's not like I see people on Sunday's anyway. One night, when my mom was still here, we were taking too long to get Wade to bed, so he went around to give everyone kisses and started walking up the stairs saying "bye" and "nig nig" - if only parenting were always this easy. Speaking of easy parenting...and by that I mean not easy. Wade's getting both his bottom canine teeth (are the bottom ones called canine teeth?). They're almost in, so maybe we'll see a decline in meltdowns? Doubtful. And speaking of meltdowns, Wade's loving building towers on these cars - but sometimes the towers fall over and it calls for a tantrum. This week he went from throwing cars down the stairs to using them as actual cars! And lining them up while he snacks - of course. He's been keeping busy by getting into everything. Naturally. I find myself praying that he just doesn't get hurt. I cannot keep him safe all the time, especially now, so I'm just trusting in the Lord that he won't climb over the banister or find the knives. This week he figured out how to work the water/ice on the fridge door (and I figured out that I can lock it, phew) and how to pull a chair to the counter to play in the sink or the utensil drawers. He's also been playing with his food a lot - this first picture is him eating rice off the floor. The last picture is of him drinking with two straws - straws that he got out of the dishwasher (which was luckily clean!). Oh, and he's been putting his dishes away...after they've been used. Ha! Wade's added "mine" and "no" to his speech repertoire. It's awesome. Not. Good thing he's adorable. Happy fall! Until next week (or whenever I manage to write another one - y'know, life is up in the air right now).